Originally published under the title, "Erdogan Raising 'Devout Generations'." 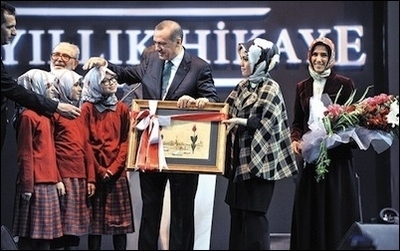 Turkey's President (then Prime Minister) Recep Tayyip Erdogan participates in a celebration marking the 100th anniversary of the religious "Imam Hatip" school system, January 2014. For Turkish President Recep Tayyip Erdogan, a pious Sunni Muslim man is, by definition, a more decent man than any other. Therefore, he reasons, a pious Sunni youth is better than any other youth. In 2012, (then prime minister) Erdogan openly declared that his political ambition was "to raise devout generations." The opposition protested that it was not a government's mission to raise devout or non-devout generations; that in a secular country this choice belonged to parents, not to the government. In response, Erdogan said: "Should we, then, raise atheist generations?" He does not understand. He evidently will not. At an inauguration ceremony in March 2015, Erdogan proudly said that the number of "imam school" students had risen from a mere 60,000 to 1 million. That is wonderful news for Erdogan, himself a graduate of an "imam school." Erdogan does not hide his divisive and discriminatory thinking about Turkey's "two youths." In a recent public speech to supporters of his Justice and Development Party (AKP), including big groups of "pious youths," Erdogan labeled as "vandals" millions of young Turks, who in the summer of 2013 protested against his government in countrywide mass demonstrations. Then he addressed the "good" boys and girls: "It is you who, with your hard work, moral values, knowledge and energy, represent this country's future." Education, Erdogan seems to calculate, is one of the most strategic tools to achieve his ambitions about raising "devout generations." It is for this reason that his government has the habit of resorting to every possible tactic to force children into piety and keep them away from whomever he considers a bad influence -- the "bad ones," whom he calls vandals. Recently, two "vandal" schoolchildren, who wrote "Where is Berkin? on the blackboard, were sent to their school's disciplinary board for punishment. Berkin Elvan died in 2014 at the age of 15, after nine months in a coma, after a tear gas canister shot by the police hit his head at the time of the 2013 protests in Istanbul. He had gone out to buy a loaf of bread. Since his death, Erdogan has been insisting that the boy was a terrorist. Turkey's compulsory religious education classes put pressure on Muslim and non-Muslim parents alike. But Erdogan's systematic classroom indoctrination, in favor of piety and against dissent, is more problematic than just two schoolchildren being sent to the disciplinary board. Turkey's compulsory religious education classes, which the European Court of Human Rights (ECHR) last September declared violated the right to education, put pressure not only on non-pious Muslims, but on Muslim parents and non-Muslim Turks, too. A directive sent early in February to Turkish schools by the Education Ministry states that only Christian and Jewish students will be exempt from compulsory religion classes, which overwhelmingly teach the virtues of Sunni Islam. To implement the system, the "religion" field on a student's identity card will be checked to see if he or she can be exempted from the compulsory classes. If the field is left empty (as most atheist parents do), or if any religion other than Christianity or Judaism is written, the student will be obliged to take the class. The directive is a draconian move from the earlier system, which simply allowed a student to drop the religion class if either parent was Christian or Jewish. One frustrated father told Hurriyet Daily News that he is Christian and his wife is Muslim, and they would now have to change their son's identity card details. "We had left the religion field on our child's identity card empty to allow him to decide when he turns 18. Now I will be forced to have them write Christian on the card," he said. Education is "being used to raise an obedient generation that will serve the government," says union leader Sakine Esen Yilmaz. In another incident, also in February, Christian Pastor Ahmet Guvener managed to get his daughter, also a Christian, an exemption from mandatory Islamic religious classes in her Turkish school; but he soon found that this was not an easy task. Schoolteachers offered the 17-year-old girl three options: take as an elective course either of "the life of the Prophet Muhammad, the Quran" or basic religious knowledge -- or fail the year. Guvener said that the incident seriously damaged his daughter emotionally, and accused the school of forcing religious education on students. Eventually, after the father spoke to the press about the case, the school offered his daughter an alternative: an elective course in "astronomy." 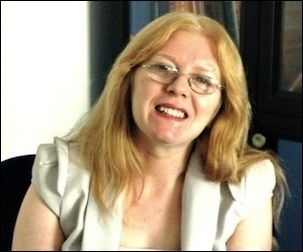 "[Education] is now being used to raise an obedient generation that will serve the government," says Sakine Esen Yilmaz, Secretary General of Egitim-Sen, a secular teachers' union. Erdogan behaves as like an unhappy father who has two children: one that he adores and the other, a maverick, to whom he can never teach the manners that a good, pious, Muslim father thinks are essential for decent upbringing. The maverick child constantly refuses to be like his devout and obedient brother. Hence the constant fighting at the Erdogan home, and his increasing frustration about the vagabond child. Ironically, perhaps, the maverick brother is sorry about the family's misery, and often stands up against the father, for which he gets punished. The good child is happy. The father is not. The father will not have peace until the maverick child has been educated into piety and has learned to respect the father unconditionally. The problem for Erdogan is that the maverick child has grown beyond his years to "change radically." For Erdogan, this is a losing family war. Too bad for Erdogan that his maverick child, half of Turkey's youth, cannot just be disowned.